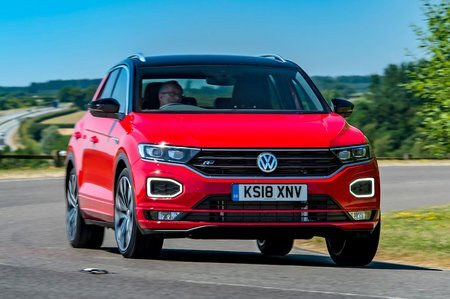 Volkswagen T-Roc 1.5 TSI EVO SE 5dr DSG 2019 Review | What Car? What Car? will save you at least £1,144, but our approved dealers could save you even more. Adds 17in alloy wheels, front and rear centre armrests, a leather steering wheel and gear knob, rear reading lights, front and rear parking sensors, power-folding door mirrors and adaptive cruise control. The infotainment system is upgraded to include Apple CarPlay and Android Auto smartphone mirroring. If you fancy some extra vim it's worth looking at the 148bhp 1.5-litre engine. It is noticeably quicker than the 1.0-litre and cuts the 0-62mph time down by almost two seconds, but it’s the added mid-range guts than proves more useful. It makes for less stressful overtaking and fewer gearchanges in everyday driving. On which subject, while the 1.0-litre is a six-speed manual only, the 1.5-litre gives you the option of a seven-speed dual-clutch automatic gearbox as well.